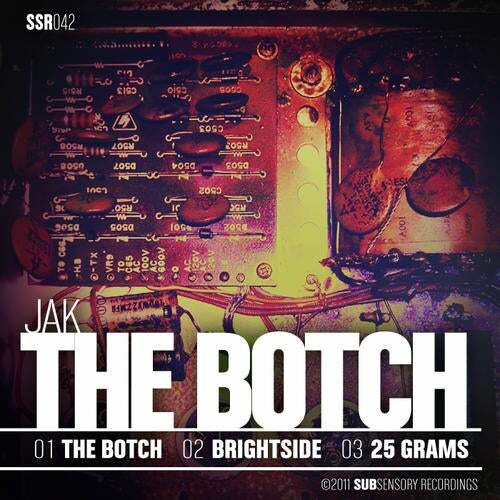 SSR042 puts the spotlight on SubSensory label boss Jack Coleman aka JAK with three original tracks in his distinct style of funky, dancefloor driven techno.The Botch is a warm, acidic, funk bomb. The infectious acid line, classic stabs, swinging groove and rolling sub-bassline provide massive amounts of energy, making this a sure-fire dancefloor rocker.Brightside combines elements of techno, minimal and electro in a modern dancefloor destroyer. The ever-evolving bassline climaxes with serious intensity. The shuffly grooves and percolater-esque percussion give a touch of fun and meld expertly with the tune's dark energy.25 Grams is a stripped down affair, yet a weighty proposition. The low, warped bassline is destined to vibrate bass bins and minds. The top end ties it all together with a smooth percussive groove and a series of nicely manipulated bloops and bleeps.